ESSN founders Dr. Amy Klinger and Amanda Klinger delivered a series of free school safety workshops across Ohio this week. The evening seminars, sponsored by Ashland University’s College of Education, provided an in-depth view of the state of school safety in the US, as well as a discussion of effective strategies for violence prevention and crisis response. Tuesday’s session in Columbus was also LiveStreamed via Ashland University and ESSN’s Facebook pages. ESSN’s Amanda Klinger and Dr. Amy Klinger recently conducted two days of bomb incident management training in San Marcos, TX. The trainings, sponsored by the Texas School Safety Center, covered preventing, planning, and responding to bomb threats and incidents. ESSN’s Amanda Klinger was the featured expert in a recent Nashville media story on the frequency and impact of lockdowns on students. Klinger gave suggestions and insights on the need for good communication as part of an effective lockdown. Click here to see the full story. Dr. Amy Klinger was a recent guest on KJZZ radio in Arizona. She was the featured expert on The Show to discuss the implications and issues raised by the recent release of the report on the tragedy at Stoneman Douglas High School. Click here to listen to the program! “It’s beneficial what we see, to identify trends and determine what is different about each case. The only way to prevent these is to know where they are coming from. We need to look at whether there was a disclosure of information. Were other people concerned. Were people egging them on, if there was a catalyst,” Klinger said. Amy Klinger, director of programs for the Educator’s School Safety Network, which does consulting and threat assessment training, said there should be equal money spent on technology or hardware and training, and that metal detectors are proven not to work. "We need to come to an all hazards approach to school safety so it can't just be the only thing we worry about is an active shooter," said Dr. Amy Klinger, director of programs for Educator's School Safety Network. "We really need to be prepared for all of those things and I think it's important for parents to understand there is so much that we can do, this is not a hopeless situation." While Dr. Amy Klinger's statistics on school safety are shocking she says there's a lot to be done and it's not necessarily buying more safety equipment. "We have to come at this from an education perspective because we are a people business so you need to invest in people not stuff and not just a law enforcement perspective, an education perspective," said Klinger. Specifically, Klinger said there’s been a more than 60 perccent jump in threats against schools in the last year. Of those, about 800 were bomb threats. But just because they didn’t involve guns, Klinger said there’s still plenty of reason to be concerned. “If every gun in America magically disappeared tomorrow, we would still have school safety issues," she said. Much of the reason behind the huge increase, Klinger found, was due to heightened attention around school safety. “It’s in the media more. It’s in the consciousness more,” she said. More than 700 educators from the U.S. as well as other countries participated in a webinar today sponsored by Blackboard and hosted by EdWeb. Dr. Amy Klinger and Amanda Klinger were the featured presenters discussing “School Safety: It’s Not Just About Active Shooters”. Today’s webinar surpassed previous attendance records for the webinar series. Amanda Klinger and Dr. Amy Klinger Featured in national radio show. ESSN experts Amanda Klinger and Dr. Amy Klinger were featured on the EduTalk national radio show today. They discussed a variety of school safety concerns and issues with host Larry Jacobs. Click here to listen to the show. 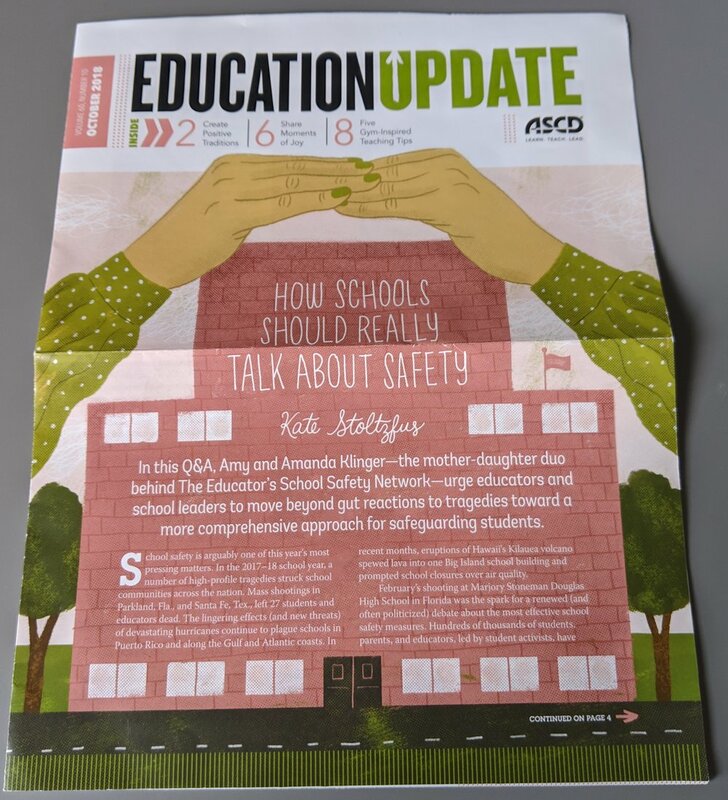 Dr. Amy Klinger and Amanda Klinger were interviewed for an important discussion about school safety in the October issues of ASCD’s Education Update. See the full article here. ESSN's Amanda Klinger advises- "Educators need to be trained on assessing threats"
ESSN expert and attorney Amanda Klinger was interviewed as part of media coverage regarding an Ohio based threat. She discussed the critical need for educators to be trained to respond to threats of violence as well as incidents of violence. Read the full story here. Dr. Klinger weighs in on "Emergency Kits"
Brockton Schools in Massachusetts have implemented emergency kits in each classroom. ESSN's Dr. Amy Klinger was interviewed on the effectiveness of these response kits. See the full article here. "You'd better make these schools safe..."
Dr. Amy Klinger was a featured expert in Education Week's back to school coverage of school safety. Read the full article here.